Fanoon: Center For Printmedia Research was launched in 2012 by the Painting + Printmaking department at Virginia Commonwealth University in Qatar, making it the first print publishing program of its kind in the Middle East. The program collaborates with local, regional, and international artists in the creation of print editions and the realization of research projects that explore the role of print in contemporary culture. Approximately four artists are invited to VCUQatar every academic year, where they may work anywhere from one week to one month on a particular project. 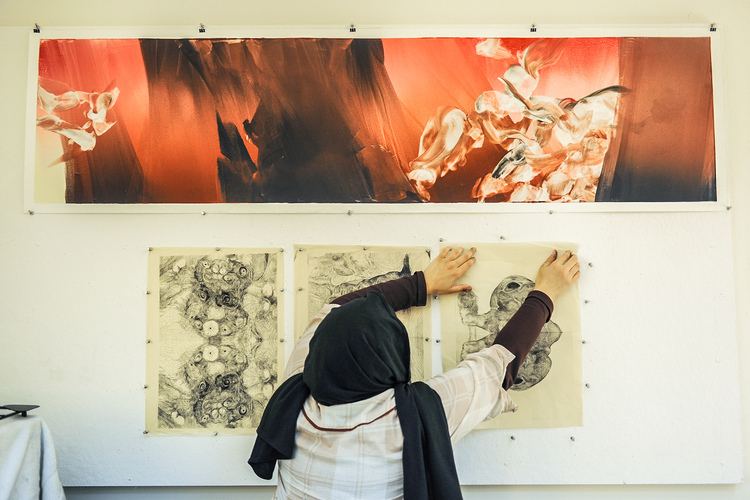 These visits take place within a learning environment where students assist the artists and Fanoon staff in the production of the work, and artists are able to engage with the university community through lectures, class visits, and student critiques. As printmaking enters a watershed moment in the medium’s history, which spans the Gutenberg press through to social media platforms, Fanoon aims to explore print’s capabilities and relevance. The center encompasses a wide range of media into the vocabulary of printmaking, from analog tools to new digital technologies. We aim to expand the possibilities of print in the 21st century by selecting artists who can engage with printmaking from a variety of perspectives and experiences, including painting, sculpture, video, photography, and performance. Working directly with these artists to assist in the execution of their projects, students are exposed to new ideas and processes, giving them an invaluable opportunity to witness a range of artistic practices firsthand.